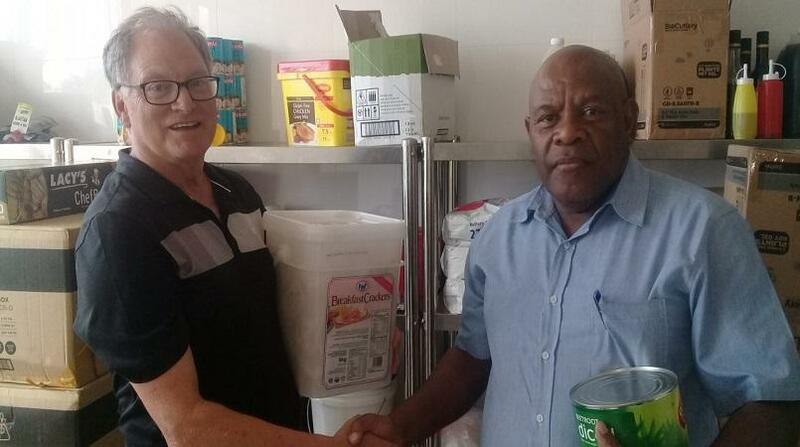 Vanuatu’s Vila Central Hospital has received a container load of dried goods and frozen meats from the organisers of the Pacific Mini Games, Van2017. “It was great for the hospital to benefit from the Games and use some of the products that were not fully consumed during the Games,” said CEO of Van2017, Clint Flood. These were items that Pacific Catering had purchased under their contract to provide the athlete meals, and a provision in the contract allowed Van2017 to donate any unused products. Pacific Catering provided 50,000 athlete meals at the convention centre from the period Nov 28- Dec 19. On hand to receive these goods was a very grateful Hospital Superintendent, Dr Santos Wari, “It’s wonderful to have this food for our patients. The Pacific Mini Games were great for the people of Vanuatu, and we are happy to receive some much needed support.” During the Games the Ministry of Health and other Government departments provided first class service to the Athletes and Spectators of the Games which included medical surveillance, hospital care, polyclinic services, ambulances, medical equipment and pharmaceuticals. Over the period leading up to and during the Games, over 110,000 meals were provided for the Games athletes and workforce. This generated over VUV120 million in local spending, and employed well over 300 people with various food service contractors. Van2017 is still hard at work to ensure that all suppliers and contractors are paid up and is also working hard towards an eventual handover of all assets currently under its care to the Government of Vanuatu.